Dads take your daughters out for a memorable night! 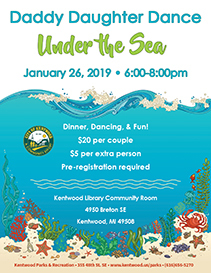 This year's theme is "Under the Sea." The evening will include dinner, dessert, crafts, a photo area with props and, of course, dancing. Cost is $20 per couple, $5 per extra person. Pre-registration is required. Call (616)656-5270 to register. NOTE: Our Daddy Daughter Dance is sold out! We will accept names over the phone for the waiting list and will notify if there are cancellations. We will not accept registrations on site at the dance. We look forward to seeing our 80 registered guests at the event on January 26!